When all planets exist on the one side of Rahu-Ketu axis in any horoscope, Kalsarpa Yoga is formed. Udit Kalsarp Yoga is formed when all the planets are near Rahu whereas their positioning on the other side forms Anudit Kalsarp Yoga. Frequent recurrence of High Tides (Spring Tides). Increase in mental tensions among people resulting into frequent quarrels. Increase in birth of mentally retarded children. When Moon is in 4th or 10th house it causes high tides in the sea whereas in 1st or 7th it causes low tides. If we take into account the astrological phenomena, we find that the intensity and frequency of tides rapidly increase when Sun and Moon are together i.e on Amavasya (New Moon). Similarly when all the planets are with Moon or in its vicinity the tides occur regularly. Similarly the earthquakes occur because of the shaking of layer of earth because of the gravitational pull of the other planets. Therefore when gravitational pull of all planets concentrate on one side it starts creating high pressure on the layer of the earth and the continental plates start sliding thereby causing earthquakes. When earth gets affected that strongly with the impact of this gravitational pull then how come man abstain from it? During Kalsarp Yoga too the imbalance in the gravitational force comes into play affecting thereby mental, physical, material and social life of people. Because of these negative effects only, Kalsarp Yoga is considered a negative Yoga and therefore astrologers recommend different remedies too to decrease its malefic influence. But a person having Kalsarp Yoga in his chart is also equipped with some special ability as well. In order to find out the number of horoscopes in which Kalsarpa yoga exists, it will be essential to calculate the number of total horoscopes existing in the world in approximity. In each horoscope there are 12 Lagnas. 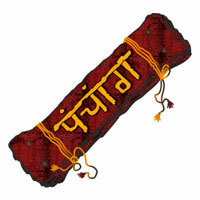 Sun, Moon, Mars, Jupiter, Saturn and Rahu can occupy any of the 12 houses independently. Mercury remains with Sun or it shall be one house behind or ahead of Sun. Venus remains with Sun or else one or two houses behind or ahead. Ketu always remains in 7th from Rahu. In this way Mercury can remain in three, Venus in five and Ketu in one house independently. Therefore total number of horoscopes can be = 12(Lagna) x 12(Sun) x 12(Moon) x 12(Mars) x 3(Mercury) x 12(Jupiter) x 5(Venus) x 12(Saturn) x 12(Rahu) x 1(Ketu) = 53,74,77,120 means 53 crores, 74 lakhs, 77 thousands,120 horoscopes only. If we assume world population to be 700 crores then on the average there shall be 14 people for each horoscope. In astrology Rashi is not the only basis rather Nakshatras are also considered and there are three Nakshatras in 12 Rashis so total 36 combinations. If we also count the Charanas(divisions) of Nakshatra too then there are 9 Charanas or Navamshas in a Rashi. According to this calculation the Lagna has 108 Navamshas. Similarly Sun, Moon, Mars, Jupiter, Saturn and Rahu can be there in 108 Navamshas independently. Mercury can be with Sun or 9 Navamshas behind or ahead, means it can be in 19 Navamshas independently. Similarly Venus can be with Sun or 17 Navamshas behind or ahead means can be in 35 Navamshas. Ketu can be opposite to Rahu in one Navamsha. Therefore total horoscopes can be 108(Lagna) x 108(Sun) x 108(Moon) x 108(Mars) x 19(Mercury) x 108(Jupiter) x 35(Venus) x 108(Saturn) x 108(Rahu) x 1(Ketu) = 11.3969313873 x 1016 = 1139 crore crore horoscopes. If we assume world population to be around 700 crores then there shall be about 1½ crore horoscopes per person. As average age is around 70 years, so around 10 crores of children take birth every year. As per this calculation a horoscope can't get repeated for 100 crore years. If we go deeper into minute calculations and consider Shastyamsha and other calculations then we can say that two people on this earth can never have similar horoscopes. In the horoscope of twins also there remains some difference atleast on minute level certainly. There can be any Lagna out of 12 and Rahu can be in any of these 12 houses independently. For complete Kalsarp Yoga all the planets should be hemming between Rahu and Ketu only, means they can be in any 7 houses. If Rahu is conjunct with Sun then Mercury shall be one house behind or with Sun means can be in two houses only. If Mercury is one house ahead of Rahu then complete Kalsarp Yoga gets cancelled. If Sun is one house behind Rahu then Mercury can be with Sun or else one house ahead or behind Rahu. Similarly Sun can be in 5 houses and Mercury in three places means can be at 15 places independently. When Sun is conjunct with Rahu or Ketu then Mercury can be at two places only. Therefore in horoscopes containing Kalsarp Yoga planet Mercury can be in any of the 7 signs and 19 houses independently. Similarly when Sun is conjunct with Rahu then Venus can be in three houses independently. If Sun is one house behind Rahu then Venus can be in four places. If Sun is two, three or four houses behind Rahu then Venus can be in 5 places independently. Therefore in horoscopes containing Kalsarp Yoga planet Venus can be in any of the 7 signs and 29 houses independently. Therefore the complete Kalsarp Yoga is formed in - 12(Lagna) x 12(Rahu) x 7(Sun) x 7(Moon) x 7(Mars) x 19/7(Mercury) x 7(Jupiter) x 29/7(Venus) x 7(Saturn) = 2,72,14,992 means 2 crore 72 lakhs, 14 thousand 992 horoscopes. Out of 53 crore the complete Kalsarp Yoga is formed in only 2 crore people's horoscopes means Kalsarp Dosha is there in one of the 19.75 horoscopes. 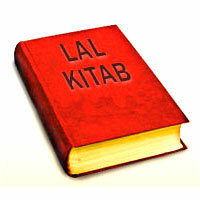 The Anudit Kalsarp Dosha is available in exactly equal number of horoscopes. Therefore Udit or Anudit Kalsarp Yoga is there in one out of 9.87 horoscopes. The degree of planets is not considered in above calculations because usually formation of Kalsarp Yoga in horoscopes is checked on the basis of Rashi. If all the planets are on the one side of Rahu Ketu axis and the Moon on the other then it is known as Anshik (partial) Kalsarp Yoga. In partial Kalsarp Yoga the Moon can be in 5 signs only. Therefore horoscopes containing Udit Anshik Kalsarp Yoga are = 12(Lagna) x 12(Rahu) x 7(Sun) x 5(Moon) x 7(Mars) x 19/7(Mercury) x 7(Jupiter) x 29/7(Venus) x 7(Saturn) = 1,94,39,280 horoscopes. 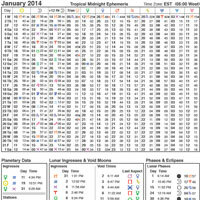 Means out of 27.65 horoscopes only one chart contains Anshik Udit and Anshik Anudit Kalsarp Yoga. Out of 27.65/2 = 13.82 horoscopes just one horoscope only contains Anshik Kalsarp Yoga. In totality Udit, Anudit, Complete and Anshik Kalsarp Yoga is in one out of horoscopes. If we count Manglik charts then out of each set of 12 horoscopes 5 contain Mangal Dosha means out of 2.4 charts one chart is Manglik. It means that occurrence of Kalsarp Dosha is 50% lesser than Mangal Dosha. 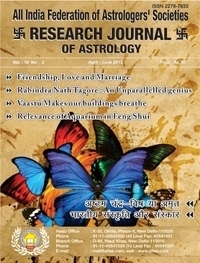 In this issue of Research Journal the majority of articles are on various astrolgical combinations, numerology, vastu and fengshui etc.